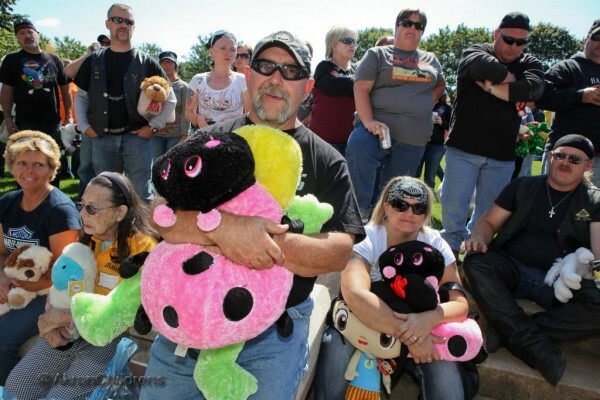 It’s a sight that always unexpectedly brings tears to my eyes: more than 2,000 motorcycles turning onto Bowery Street, each driven by a biker with teddy bears and other stuffed animals in tow for the patients at Akron Children’s Hospital. The noise is deafening, and the sense the gratitude by the participants is overwhelming. The 17th annual Children’s Caravan took place on Sept. 16, a perfectly sunny day for the 45-mile ride from Dover, Ohio, to Perkins Square Park on Akron Children’s campus. The Children’s Caravan began in 1996 as a way for a grateful mother, Penny Martin, to give back to the hospital that took care of her son, David, who received treatment for a heart condition at Akron Children’s when he was 8. David is now 26 and each year, he takes the time to visit the pediatric intensive care unit to personally deliver stuffed animals to the patients. This year, more than $6,000 and 6,000 stuffed animals were donated to Akron Children’s Hospital. Thanks to all who participated. See you next September.